In April of 2017 Sue journeyed to the far northern reaches of Canada to research her upcoming book, a tracking guide covering selected North American mammal species and their importance in conservation planning. It is scheduled for delivery to her publisher in 2018. You can view some of Sue's photographs from the trip by clicking here. Keeping Track expresses its deep appreciation to Theora Ward, good friend and former Board member, for her role in conducting this interview. You have recently returned from an exciting expedition to the High Arctic. Where exactly did you go and what was your goal? This expedition to gather information for my upcoming book took me to Ulukhaktok and the vast, barrenland and sea ice environment on and around northern Canada’s Victoria Island in the Northwest Territories. My goal for the trip was to photograph musk oxen and, possibly, other wildlife as encountered. In addition, I wanted to experience the High Arctic and the often brutal climatic conditions there. Extreme winds and 50 to 60 below temperatures create some of the most severe weather conditions that wild animals and people are known to endure. I was delighted to be afield with two Inuvialuit guides, David Kuptana and Isaac Inuktalik. These men have intimate knowledge of their vast territory consisting of hundreds and hundreds of square miles. As a result, on the first day I was able to see musk oxen and had a remarkable, though fleeting, opportunity to photograph an Arctic wolf. As we so often realize during our Keeping Track field classes, it is all about being in quality habitat, where inevitably we see plenty of tracks and sign and sometimes the animals themselves. There were many highlights. I was especially excited to observe musk oxen scent-marking and interacting with one another. I was also intrigued to study and take photographs of their “feeding craters” – excavations the musk oxen must dig into the snow to expose the sedge species they are seeking to eat. I could see that this activity took an enormous amount of energy, especially if wind, abnormal snow depth and icing conditions made digging difficult. Unfortunately, my guides acknowledged that in recent years they have seen these weather conditions worsen because of climate change. These hardships have caused musk oxen to expend much more energy in order to find sufficient food. I personally saw evidence of this; three yearling calf carcasses that I examined were all dangerously thin with little or no stored fat. The absolute highlight of my trip happened when we spotted two polar bears way out on the pack ice. David examined them with binoculars and concluded that they were a courting pair. He speculated that if he and I took a route way to the west and then south of them, Isaac could then slowly travel towards the bears and perhaps they would run away from him and move in our direction, enabling me to get a photo. That is pretty much what happened, except that the female had her own ideas about where to go next, and did not accompany her suitor. Minutes later I looked in disbelief and there he was, Nanook of the North, coming right towards me! He was so close I could hear him grunting as he galloped by. The next day, when we were following his tracks, so I could photograph them, we were happy to see that he was reunited with his ladylove. On our third day out on the “Land” I discovered the most exquisite wolf tracks. Each track was a wind scoured, elevated compression left behind when the soft snow surrounding it had blown away. I have heard you played an integral role in a rescue. Can you tell us about that? We had just descended from a high plateau down to the coast when we noticed a tent on the sea ice. David was instantly concerned because one would not ordinarily camp out there, so he recommended that we go and investigate. When we arrived on the scene we discovered Isaac’s older brother, Donald, sprawled on the ice. He was in obvious great pain, and his face was bleeding. Donald’s young grandsons, Colten Inuktalik and Wyatt Joss, had bravely taken action and set up their tent for shelter. They told us that their grandfather had been thrown from his snowmobile in an accident, and he’d been crushed under the machine. I was immediately concerned about Donald succumbing to shock or hypothermia. I looked for those signs and was relieved not to see them. A quick examination convinced me that Donald had a badly broken leg and a minor head wound, but I was unable to rule out internal injuries. I immediately treated him for pain with ibuprofen and we moved him into the tent, which was already being warmed by a stove. Though he was in tremendous pain, I quickly learned that Donald was rugged as rock, yet with the sweetest endearing personality! Over the next several hours I helped stabilize him, and his brother, Isaac, and I agreed that he needed to be medevacked by air to a hospital. Throughout the rest of the afternoon my challenge was to manage his pain, keep him hydrated and as comfortable as possible. Later in the afternoon, Donald informed us that his injured leg felt wet with blood. Isaac and I removed his coveralls and learned that indeed he did have a compound fracture of the shin. We were relieved to see that there was only a minimal amount of blood associated with that wound. Using the electrician’s tape, I always carry in my first aid kit, plus appropriate antiseptic dressings, we treated and bandaged his wound. Then we stabilized his broken leg with two splints made from folded cardboard, each on either side of the shin. 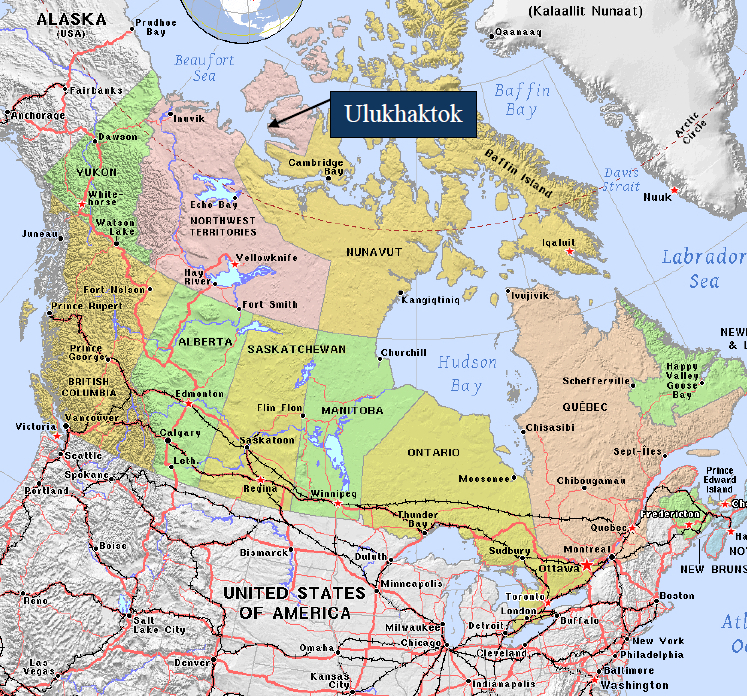 David and Isaac radioed their village, Ulukhaktok, and arranged for a twofold rescue operation. Search and Rescue Team (SAR) team members started preparations to leave the village on snowmobiles and make the four-hour journey with a stretcher and medical assistance. In the meantime, a Twin Otter rescue plane would leave Yellowknife, the nearest city, roughly 600 miles to the southwest and fly to our location. While I was caring for Donald, David and Isaac went out to mark out and smooth an airstrip on the sea ice so that the plane could safely land. Nine hours after the accident occurred the SAR team reached our remote location, and about an hour after that the plane landed. The pilot and his crew remarked that they had never seen a make-shift air strip so well-conceived and constructed. Within an hour of the plane touching down at our location Donald had safely arrived at the Ulukhaktok Health Center. The next day we learned that Donald did have a compound fracture of the shin, but fortunately no internal injuries. Once our patient and his grandsons were safely evacuated, the SAR team, along with our party, packed up all the equipment, loaded our sleds and took off for the four-hour trip back to the hamlet, under a full moon. What is the picture you take home from that moonlit journey back to the hamlet? I don’t so much have a picture in mind, but have instead a marvelous movie in my head and heart – continuous, stunning beautiful frames, each more captivating than the last. The brilliant moonlight radiated from an azure sky, everywhere illuminating the swirled laminations of wind-blown snow. Silvery moonlight shown through clear crystalline ice and throughout our journey reflected whole galaxies of snow crystals across the illimitable Arctic plain. At other times the moon cast a magical glow – accenting and backlighting towering basalt cliffs. Once we spooked several white Arctic hares that disappeared over the horizon like apparitions. I was enthralled. I am powerfully moved by the Arctic. The tougher the going the more magnificent the tenacity of life. In Inuit language “Nuna” means “the Land”, but not in our simple and utilitarian meaning. Nuna means much more than that. Nuna is the Land that includes the musk oxen, wolf, caribou, polar bear, and all birds and other animals, as well as the People – all sustained and intertwined, physically and spiritually, as equal partners in life’s journey. I felt the power of Nuna here, and will cherish it for the rest of my life. Upon her return to the hamlet, Sue was literally embraced by the community. People approached her while she was out walking so they could hug her and express their appreciation. Many others wrote appreciative messages to Sue on David Kuptana’s Facebook page. Sue was also very moved by the special effort that two SAR team members made to thank and commend her for her excellent work in stabilizing and supporting Donald during his ordeal. To view images of the High Arctic landscape, wildlife, people and the rescue, please click here.